Velikost tohoto náhledu: 800 × 594 pixelů. Jiné rozlišení: 1 108 × 822 pixelů. Map showing the historical development of border between Moravia and Silesia, borders of the Silesian subdivision (Slezská expozitura) within the Moravian-Silesian Land (Země Moravskoslezská) of Czechoslovakia, borders of the Moravian-Silesian Region of the Czech Republic, borders of the Duchy of Silesia of Austria-Hungary and borders of the City of Ostrava. Red line shows the border of the Czech Republic in 2008. Yellow line shows the southern border of the Silesian subdivision within the Moravian-Silesian Land of Czechoslovakia. 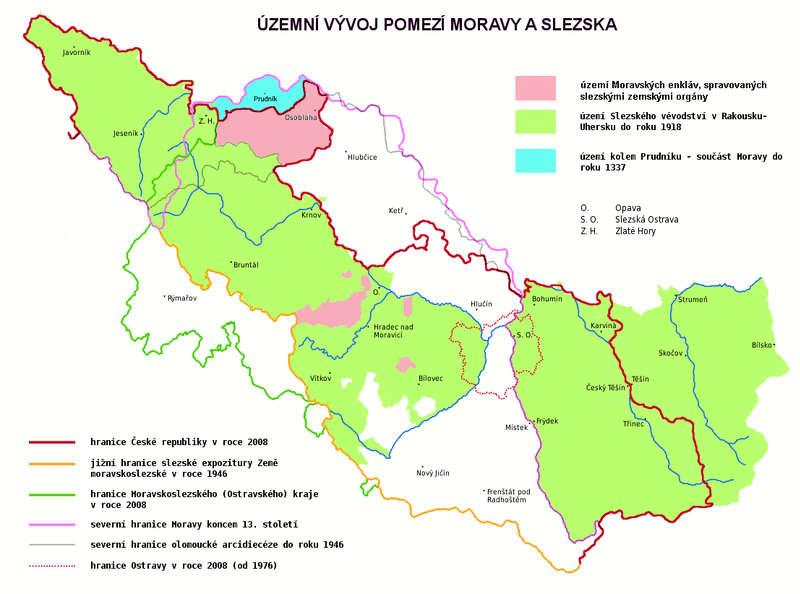 Green line shows the border of the Moravian-Silesian Region (Moravskoslezský kraj) of the Czech Republic. Pink line shows the northern border of Moravia at the end of the 13th century. Grey line shows the northern border of the Olomouc Archdiocese. Dotted line shows the border of the City of Ostrava in 2008. The area in green shows the former Duchy of Silesia (the Austrian Silesia). The area in blue shows land around Prudnik, which was a part of Moravia until 1337. The descriptions are in Czech.